Dance and pop legends lead the line up at Final Fling 2019! Still lots to enjoy in The Terrace before the end of the year! The glitziest night of the year is coming... don't miss The AU Awards! Look no further than the SU Shop for food, drink, course materials and more! Final year students…just weeks left to have your say and win great prizes. The SU Student Support team is coming to you this May! A very warm welcome to the April/ May edition of the monthly newsletter from Teesside University Students’ Union (TUSU). We’ll be in touch every month with the latest news and events from TUSU unless you ask to stop by unsubscribing. We want to begin this edition by saying goodbye, good luck and a massive thanks to Tom Platt (former President Education) who left TUSU for personal reasons on 25th March after eighteen months in his role. There’s more about Tom and his impact further down. A gold rating in the prestigious Best Bar None accreditation scheme. A fourth consecutive victory in the Tees-Wear Varsity over our friends and rivals from the University of Sunderland. In addition we want to congratulate all of this year’s Societies Awards winners and nominees and we’re looking ahead to two fantastic events before the end of the academic year…the Athletic Union Awards and the legendary Final Fling! We hope you’re having a great spring break and make sure TUSU is right at the heart of your student life in this final few weeks of the academic year! Sophie and Andy – Student Officers 2018/19, tees-su.org.uk/officers. Tom Platt (former President Education) left his role on 25th March for personal reasons. We thank him for his work in the role and as Chair of our Board of Trustees over the past 18 months. Sophie Bennett (President Welfare) and Andrew Richardson (President Activities) will continue in their roles for the balance of this year and George Reeves (President Activities Elect) will join Alan and Sophie as the Student Officers from July 2019. Watch a short video tribute to Tom here and find out more about the Student Officers Elect here. International students who completed the prestigious International Student Barometer (ISB) 2018 have placed Teesside University Students’ Union (TUSU) first in the world for facilities, social space and the experience they’ve had participating in sports clubs and societies. We’ve also secured gold standard again in the nationally recognised Best Bar None accreditation scheme which celebrates best practice when running licensed premises and putting on evening events. Students who completed the International Student Barometer were asked to provide feedback on a range of aspects of their experience at Teesside University, 410 of them completed the survey and TUSU placed first out of 43 participating in the Students’ Union category. The Best Bar None awarding body commended the highly responsible approach TUSU takes to running licensed premises and the excellent performance of career and student staff who work in them. TUSU secured a rating of 100% and placed second in the UK. The latest successes come just months after our SU Student Support (SUSS) service retained the prestigious Advice Quality Standard (AQS) with no recommended improvements and a number of areas praised by the external assessor. Teesside University also ranked highly in the ISB with first place for overall satisfaction, first place for overall satisfaction with student support and second for satisfaction with performance feedback out of 199 world universities participating. In addition there were high levels of satisfaction with learning, quality of lectures, course organisation, student life and accommodation. The SU Building is only open weekdays and closes at 5pm each evening. The entire building is closed on Good Friday (19th April) and Easter Monday (22nd April). At least one Student Officer is available throughout the spring break (not including Good Friday or Easter Monday). The Terrace and The Hub are closed, except for private parties until and including, Sun, 28th April. The SU Shop is open weekdays only (not including Good Friday or Easter Monday) from 9am to 3pm. This may change subject to levels of trade and we'll make you aware on our social media and website. SU Student Support (SUSS) is open weekdays (not including Good Friday or Easter Monday). Reception is available from 11am to 2pm. SU Activities staff are available over the spring break (not including Good Friday or Easter Monday) but please ring or e-mail ahead to ensure they are free. The SU Wecome Desk is open weekdays as usual (not including Good Friday or Easter Monday). The SU Studio and Snooze Room can be booked out from the Welcome Desk through the week from 9am to 5pm (not inlcuding Good Friday or Easter Monday). Teesside University Students’ Union (TUSU) will welcome international dance stars Chase and Status and pop legends Scouting for Girls as headline acts at our end of year event Final Fling 2019. They’ll be joined at the top of the bill by rising stars Lotto Boyzz. The event, taking place on Fri, 17th May around and inside the Students’ Union building has grown from a hugely popular end of year party for students to one of the biggest live events in Teesside over the past 5 years. The guests now include many members of the wider community alongside students, all eager to enjoy live music, fairground rides, giant games, three rooms of music, a fun packed Bier Keller and more. Headliners Chase and Status, who will close the music stage with a storming DJ set featuring MC Rage, have released five acclaimed albums and a string of hit tracks over the past decade including “All Goes Wrong”, “Time”, “End Credits”, “Hitz” and “Flashing Lights”. They’ve worked with some of the biggest names in music along the way and topped the bill at a string of international festivals. Scouting for Girls, famed for their offbeat but catchy pop, have had 8 top 40 hits over the past decade including the ever popular “She’s so Lovely”, “Elvis Aint Dead”, “I wish I was James Bond” and “This aint a love song”. They’ve also picked up four BRIT Award nominations along the way and remain a hugely popular live act thanks to their energetic, audience focussed performances. Lotto Boyzz are a Birmingham based Afro beat duo who have enjoyed critical acclaim and airplay with tracks such as “Did it Again” and “Facetime Me”. They also featured on hit track “Bad Vibes” by all female act M.O. last year. The main stage will also see the return of hugely popular duo Rewire and VARSKI keeping the crowd energised with their lively performance style and playing a wide range of music throughout their DJ set. And, for the first time, guests can enjoy the growing phenomenon Massaoke. A superb live band will play rock, pop and indie anthems but the crowd are the stars of the show singing along as lyrics appear on huge screens either side of the stage. Why not make a night of it at Final Fling with a room that three people can share for just £50 (Just over £16.50 each)courtesy of our friends at Holiday Inn Express Middlesbrough (based on Albert Road)? The offer is open to anyone attending the event and you can check in from 3pm on Fri, 17th May then come and go as you please until 12pm on Saturday, 18th May...breakfast is included in the price! To find out more and book simply e-mail: reservations@hiexmiddlesbrough.co.uk using the code IEYPY. Get all the latest updates on the fling and buy tickets by clicking here. *TUSU accepts no responsibility for nor does it endorse the content of external websites. Sports teams from Teesside University produced another dominant display in the annual Tees Wear Varsity on Wed, 20th March winning by 11.5 points to 3.5 points against our friends and rivals from the University of Sunderland. The event, held here on the Teesside University campus and sports facilities close by, saw Women’s Football and Men’s Football cap successful seasons with comprehensive wins in all four of their matches including a 13-3 win for the women’s first team. Meanwhile, Dance dazzled an enthusiastic crowd with their energetic display to win 240 to 216 and Cheerleading picked up a narrow but richly deserved win by 85% to 81%. Netball also scored two decisive victories and Archery fired themselves to a hard fought 2065 to 1613 win. There’s a full list of results, video highlights and pics at tees-su.org.uk/varsity. Net Ethical Hacking have been named Society of the Year and the School of Computing, Design and Technology School Reps picked up the Team of the year title in their categories at the new look Societies and School Reps Awards 2019. The event, held in association with TS1 Students, on Thu, 4th April at Teesside University Students’ Union saw a total of 12 awards presented along with the special “Society Stripes” recognition for a number of societies who have performed well and met or exceeded a range of criteria set down by the Students’ Union over the past academic year. Net Ethical Hacking were recognised for the active role they’ve played in Societies Federation, creating new campaigns and holding a range of interactive events alongside working closely with both Student Officers and staff at the Students’ Union. Meanwhile, the SCDT Reps were commended for the difference they have collectively made to the learning and teaching experience in their school over the past year. In other categories, Ollie Pepper (Tabletop Gaming) was named Societies Personality of the Year for the second year in a row after working tirelessly to bring all societies closer together while playing a major role in the development of his own while the School of Health and Social Care’s Alison Anderson was judged School Rep of the Year, the midwifery student has been an important voice for students in her school throughout the year, juggling those responsibilities with a demanding course and family life. Andrew Richardson, President Activities at TUSU, said: “A huge congratulations to all of the winners and nominees, I know we always say it but it really was an incredibly tough choice in every category, societies have gone from strength to strength again this year here at TUSU. It’s always a pleasure to recognise the great collective and individual work that has been done over the academic year and I know everyone will be motivated to take things even further in 2019/20. It was also great to celebrate the tireless and hugely important work of our School Reps…they provide vital feedback to both TUSU and the senior staff in their school and help bring about lots of positive change." You can read a full report and see all winners, watch video highlights and see pics from the event at tees-su.org.uk/awards. Nightline is a confidential, anonymous listening service provided by students for students and it’s now available from 8pm to 7am on Friday, Saturday and Sunday (Except for the Easter Bank Holiday weekend). Why not give our highly trained volunteers a call on 01642 738600…they’ll be there to listen and to help whatever you’re going through. Find out more and get info if you’re interested in being a volunteer by clicking here. There’s still plenty going on in The Terrace from Mon, 29th April to the end of the academic year on 17th May. The hugely popular Monday Night Quiz continues with different fun packed themes each week and the chance to win FREE DRINKS and CASH PRIZES. There’s loads of fun, top tunes and discount drinks between rounds too! We’ll also be showing the final season of Game of Thrones on big screens on the first floor on Monday nights. Sing your heart out and enjoy discount drinks every Wednesday night at karaoke! What better way to warm up for Go Ninja at Spensleys? The biggest mid-week student night around! The much loved Bingo Revolution is back for the last time this academic year! A sideways take on bingo with comedy, great prizes and unbeatable offers on a wide range of alcoholic and non-alcoholic drinks! Discount drinks, classic cuts and the biggest current sounds from our resident DJs plus an amazing atmosphere in which to start your weekend at 3-2-1 Fridays! Indie and rock classics, competitions, discounted entry to the main event and more at Empire Shangri-La Saturdays! The perfect way to prepare yourself for the biggest Saturday night in Middlesbrough, Shangri-La at The Empire! The chance to enjoy huge recent movie releases on screens across the first floor of the SU Building on selected Sundays with our fun, relaxed movie nights. Special one off events including…the glittering Athletic Union Awards on Wed, 1st May (followed by a Go Ninja special) and, who could forget, the end of year epic to end them all Final Fling! Keep in touch with everything that’s coming up and confirm your attendance through our events group on Facebook. You can also check out  tees-su.org.uk/events  and  tees-su.org.uk/eventsplanner. The Athletic Union Awards (formerly known as The Annual Awards) is a new look chance to recognise and celebrate the sports clubs, teams and individuals who have shone for Teesside University over the past year. A delicious three course meal enjoyed by hundreds of guests including many members of our sports clubs. The presentation of a string of highly sought after awards including club, sportsman and sportswoman of the year. A huge after party starting at the SU and continuing at Go Ninja at Spensleys. Tickets are just £30 and available now from tees-su.org.uk/awards where you’ll also be able to see highlights from the 2018 event in video and pics plus a list of nominees for this year’s ceremony. A great new range of gluten free, dairy free and vegan ice cream starting from just £1. A sixth coffee free when you buy five with our loyalty system. PLUS…BUY FINAL FLING TICKETS FROM THE SU SHOP COUNTER!!! The fourth annual Housing Awards, presented on Tue, 26th March 2019, were a chance for students to recognise the letting agents and landlords they felt had provided excellent service and accommodation over the past year. The winners were based on feedback to the annual Rate Your Landlord survey conducted by TUSU and included Kexgill Middlesbrough (Best Overall Large Accommodation Provider), Campus Lifestyle (Best Overall Medium Accommodation Provider) along with The Room Guru (Best Overall Small Accommodation Provider). There were also special mentions for staff members Kirsty (Kexgill Middlesbrough), Nicci (Rede House), Dave (The Room Guru) and Stacey (TS1 Students) who all received excellent individual feedback from students. Find out more and watch a short interview with representatives of Kexgill at tees-su.org.uk/housingawards. Keep up to date with big announcements and events from our many wonderful clubs and societies in this new monthly article. If you’re part of a club or society and would like us to include something in future editions please click here. - The Tabletop Gaming Society are inviting everyone to a 12 hour Game-a-thon to raise funds for Macmillan Game Heroes (Part of Macmillan Cancer Support) on Mon, 6th May. 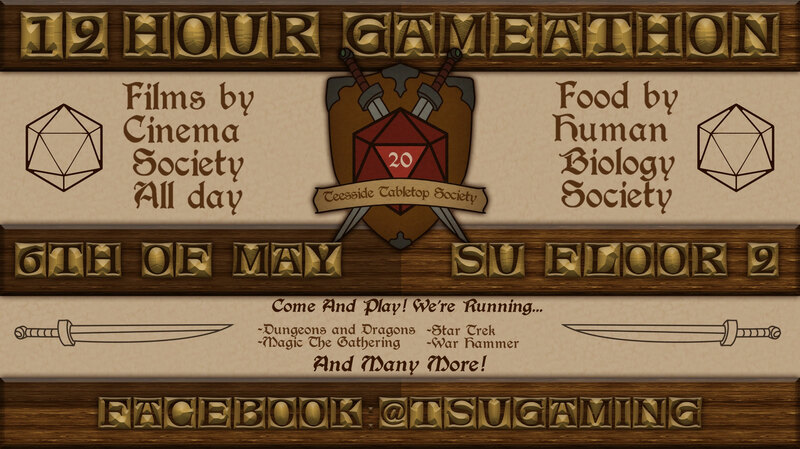 There’ll be various tabletop games including Dungeons and Dragons, Magic the Gathering, War Hammer and Star Trek. Find out more at tees-su.org.uk/events. The National Student Survey (NSS) is one of the biggest and most influential student surveys around and it closes at the end of April so don’t miss out. It’s a chance for most final year students to tell Teesside University and the SU what you thought of the teaching, resources, facilities and feedback you’ve had throughout your time here. You’ll be entered in to a prize draw to win £1,500 off further study at Teesside Uni. You can also help your course win a VIP reception during Graduation Week 2019 with the cohort who get the most respondents receiving very special treatment this July! Find out why we think you should spend a few minutes giving your feedback now at tees-su.org.uk/nss. The Totum Card and app (previously known as NUS Extra) is your gateway to great savings and big discounts all year from whatever date you buy it. 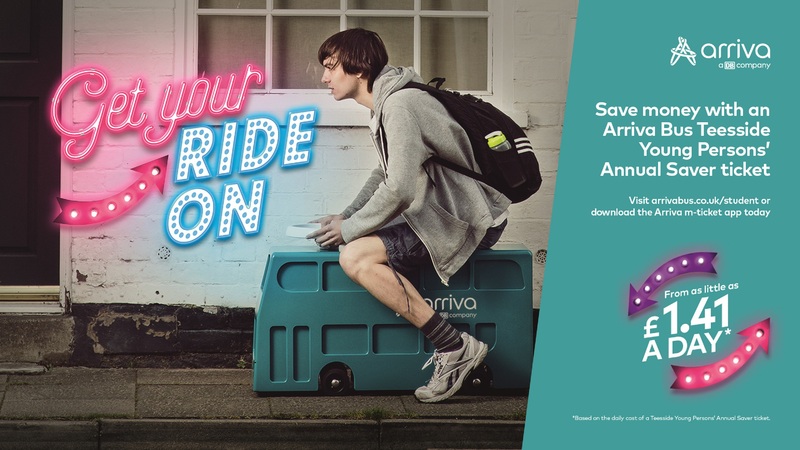 If you’re planning an adventure this spring or over the summer then why not spend just £12 to get the card and app then save a fortune with the likes of Thorpe Park, Festicket, USA Summer Camp, Super Break and many more. Don’t forget that the card also acts as an International Student Identity Card (ISIC) at no extra charge! Find out more and get your card now by clicking here. The SU Student Support (SUSS) team will be out and about around the various Teesside University Halls of Residence from 2nd to 10th May. They'll give you practical advice on what to look for and what to avoid when choosing your next student accommodation. Remember they can also help with a range of other issues including money management, your course, personal problems and more so don't be afraid to ask! Click here for full details of all the dates and locations.